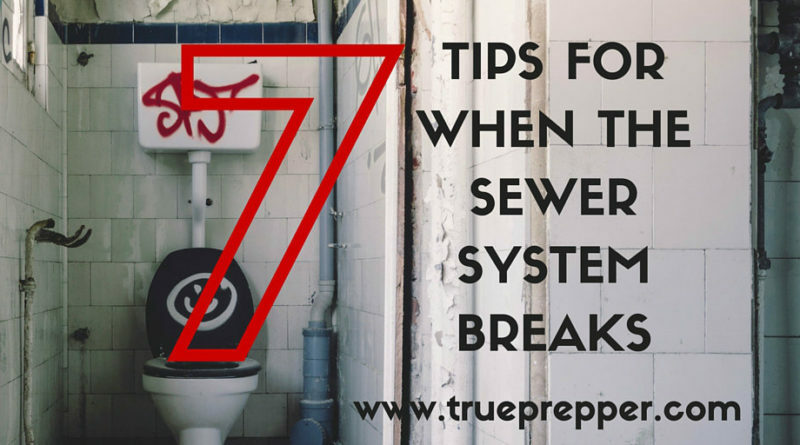 You may not realize how important your sewer system is until is is not functioning. Many of us have experienced clogged toilets, backed up septic systems, or even just having to go in an urban area when there is a toilet unavailable. Having to go but not having a place to go can be embarrassing and can even cause you to act irrationally. In a suburban or rural area, a non-functioning sewer or septic system can be easily remedied with a quick cat hole or field latrine. In an urban area you probably don’t have that luxury, or you may even be bugged in where it is not safe to go outside. Many disasters and SHTF scenarios can cause modern plumbing to easily stop working in cities. Don’t be caught off guard and risk making yourself or your family sick by not being prepared. Here are some tips to help you prepare for being caught “up the creek” in an urban environment. Using bleach to try and stave off any bad smells can be the last mistake you make. Bleach mixed with the ammonia in urine and feces can create many toxic chemicals- potent enough to kill. Especially if you are in an enclosed area, bugging in. Chloramine and hydrazine are a few of the nasty by products produced, and both cause extreme nausea and a burning sensation in your eyes. Grey water, the non-potable water you use after washing your hands or bathing is perfect for attempting to get solids to go down the drain. Your potable water supply is worth it’s weight in gold when you are bugging in, so keeping your grey water for uses like this can keep you from using up your all important water supply. A bucket toilet is pretty convenient, especially if you are prepping for others as well as yourself. In the interest of space, you can also get a bucket toilet seat, which provides a little more flexibility in where you get the bucket from. With the seat, you could use the 5 gallon bucket you already own and have it serve dual purpose (up until the point you start relieving yourself in it). The bucket toilet fix is a great portable prep that can save some scraps of dignity in an emergency scenario. You want to line the bucket with trash bags or specialty bags for easy clean up and to be able to seal any excrement quickly. Getting a lid for your bucket toilet or 5 gallon bucket can allow you to be mobile with it as well. Recreational Vehicle owners and campers are all too familiar dealing with sanitation handling solutions, so why re-invent the wheel? RV gelling agents are designed for use in portable toilets, and neutralize odors! Borrowing from the world of kitties is never a bad idea. We follow their lead outdoors when digging cat holes, so why not follow their lead indoors as well? Kitty litter is great for absorbing odors and liquid. Put about an inch in the bottom of the bucket and trash bag, and then cover each squat salvo with at least 1/2″ of kitty litter. Some pet deodorizer may also come in handy to minimize the odor. Sawdust also works well if you do not have a feline friend or their commodities around. You may think this is swatting a fly with a baseball bat, but the composting toilet is the Rolls Royce of toilets without plumbing. By composting the solids, it requires many uses before it needs to be emptied. It receives rave reviews from RV owners, campers, bug out cabin owners, and even sailboat captains. Incinerating toilets are another option for this group, but does not fit as well for an urban emergency scenario since they usually require a type of fuel. While composting toilets are not for everyone, it is worth mentioning the best option regardless of the cost and space it may take up. If you are not brushed up on your history, you may remember being taught in grade school that in the middle ages, people would toss their chamber pots out into the street from their windows. While I’m sure somebody’s best contribution to the world has come through a window onto the street, it is considered a myth that this was standard practice. They were just as sensitive to foul odors as we are today, and there were strong penalties for not using latrines (which drained into cesspits). So in an emergency situation, don’t unburden yourself to the street, you filthy animals! The best way to stay up to date with our articles is to sign up for updates by subscribing to TruePrepper, or by following our Facebook page.